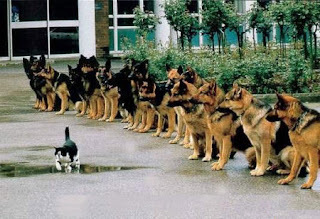 I've often seen this photo, forwarded by friends through email, and have always been impressed with the training of those dogs - to sit there, en masse, while a cat saunters by. Well, I was going through and deleting photos off of my phone and realized that I had taken similar photos recently when Maddie was visiting us. Hugo (as usual) was outside and wanted to come in. Unlike Ray, who loves to use his dog door, Hugo prefers to have his doorman hold the door open for him when he enters his abode. But the dogs were inside and every time I held open the door, Hugo would just pace nervously on the stoop. So, I put the dogs in the living room and told them to sit and stay. Hugo knows when I say "stay" that Ray's feet magically become glued to the floor and that he can freely walk by. Sometimes Hugo will race by, and sometimes he likes to abuse Ray's good nature by pacing back and forth in front of the dog or lying down a few feet away while Ray sits, very alertly, 'looking' in Hugo's general direction. In this case, though, there was the unknown quantity of that extra dog. So, Hugo came in and raced for the stairs, the stopped and thought about if for a minute. Then he rapidly paced back to me, then back to the stairs, then back to me. The dogs waited patiently until Maddie's curiosity got the better of her and she stood up. Whereupon Hugo evaporated. Disregarding the fact that Maddie piddles when she is excited and that Ray is blind, I think that these two dogs would make GREAT police dogs. They can ignore a cat with the best of them. 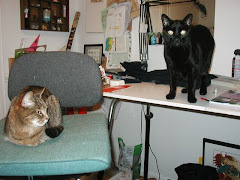 Conor amazes me now in that the kittens can be crazily freerunning past him, over him and occasionally on him and he will barely flinch, its fantastic how he has come to accept their presence and actually plays little hunt the kitten games with them.....in a friendly (I hope) way. Dogs, we should learn so much from them.